This is the news and announcements section. 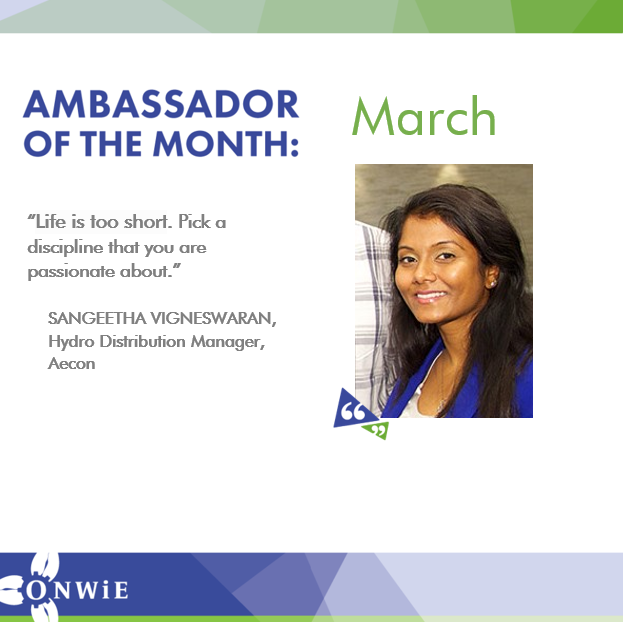 Sangeetha Vigneswaran is our Ambassador of the Month for March 2019! Sangeetha studied civil engineering at McMaster University, and currently works as a Hydro Distribution Manager for Aecon. How do you apply your degree to your career? If you are hoping to pursue a career in engineering, my advice is to find an area you are interested in and passionate about. To me, engineering is about finding ways to improve the world we live in, and you are more likely to want to do that for something that is meaningful to you. Engineering is definitely a difficult area of study and generally results in a career path that can be challenging. Without my interest in space exploration and knowledge that what we learn on orbit can help us here on Earth, it would have been much more difficult for me to pursue this path. Kristen Facciol is our Ambassador of the Month for 2019! 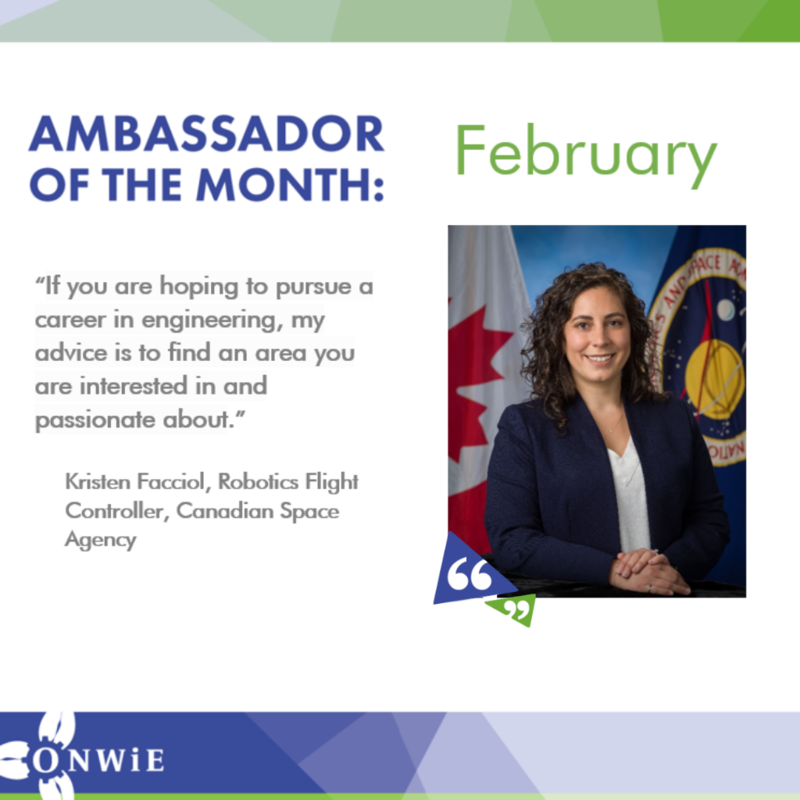 Kristen studied aerospace engineering at the University of Toronto, and currently works as a Robotics Flight Controller for the Canadian Space Agency. I chose engineering because I wanted to ensure that whatever came next in my life would be built on a strong foundation. I always had an affinity for math and science, and wanted to learn the ways in which these subjects were applied or could be applied to improve our future. Not only did studying engineering mean I would graduate with a professional degree, but also that I would have a better understanding of how the things around me worked. I am currently working as a Robotics Flight Controller, which utilizes my degree in many ways from a technical perspective as well as makes use of the soft skills I developed while in school. Primarily, my job involves working as part of a multidisciplinary team whose focus is on system operations and problem solving. In order to perform well in these scenarios, it is important to have a strong understanding of the foundations – like control systems, communication protocols, and electronics – so that they can be correctly utilized. 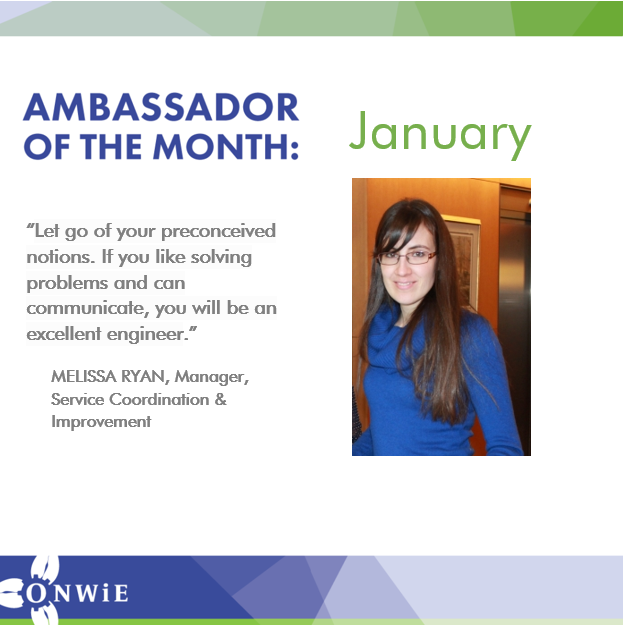 Melissa Ryan is the first Ambassador of the Month for 2019! Melissa has both a Bachelor’s and Master’s of Science in environmental engineering from the University of Guelph, and currently works on storm water management projects for the City of Kitchener. I thought engineering = train conductor. I excelled at math, chemistry and physics and it was pure luck that I had a very good guidance counsellor that suggested I look into engineering and explained that there were many facets to it. I am a project manager that oversees the design and construction of stormwater management projects. I review the designs and ensure the project stays on track and on budget. Let go of your preconceived notions. If you like solving problems and can communicate, you will be an excellent engineer.